This Lighted Mason Jar tutorial is easy and fun to make! Mason jars are so great to create home decor with! There are so many different ways to use mason jars throughout your home year round. This is a DIY that can be very personalized based on your tastes and what supplies you have on hand! This is only an example of one way to make this Lighted Mason Jar! Be creative and be sure to send me a picture of your final creation!! 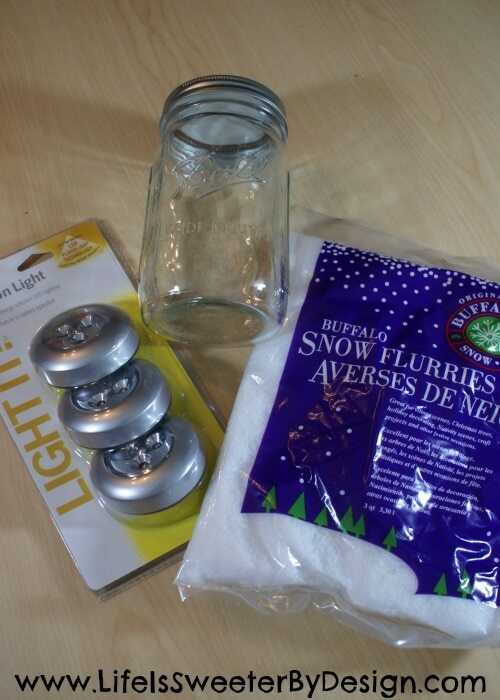 Once you have your supplies gathered up you need to get your LED light attached to the underside of the mason jar lid. This project requires a specific kind of LED battery operated tap light to work. This LED light is just the right size to fit inside the jar without being noticeable! You can get these in a 3 pack from Amazon for cheap!! 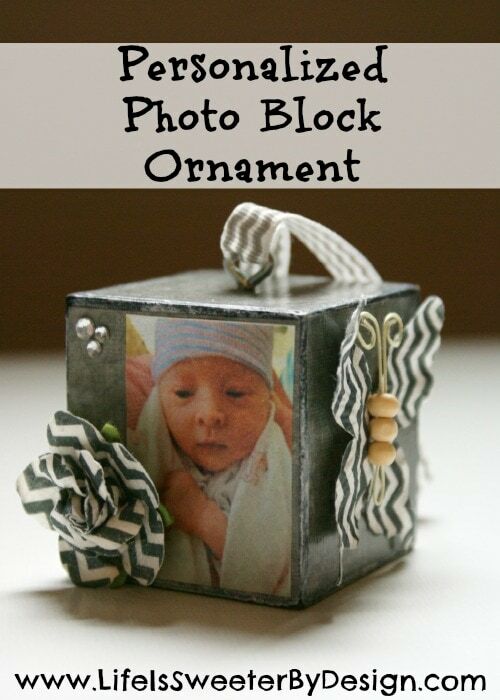 That lets you make 3 jars to keep or give one or two away as gifts! First you need to take the top off the tap light and put your batteries inside. 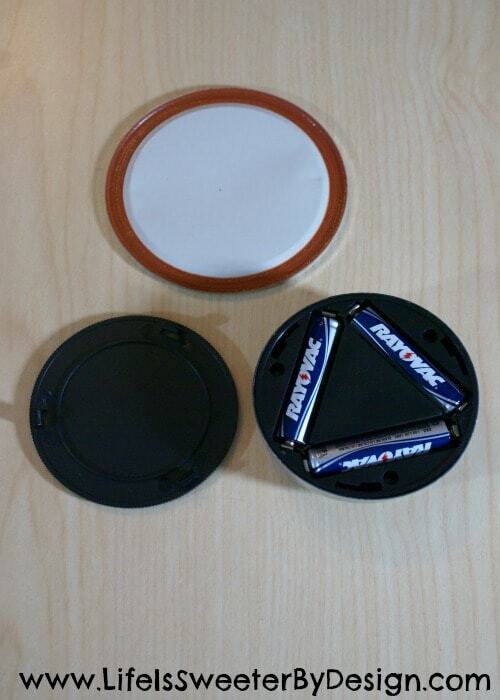 Next you will hot glue the top lid of the tap light onto the underside of the mason jar lid. Once you have glued it on and the glue has dried you can attach the body of the tap light to the top part that you glued on. Now when you take the lid off the mason jar you will just tap the light to turn it off and on. The next couple of steps can be done in any order you choose! 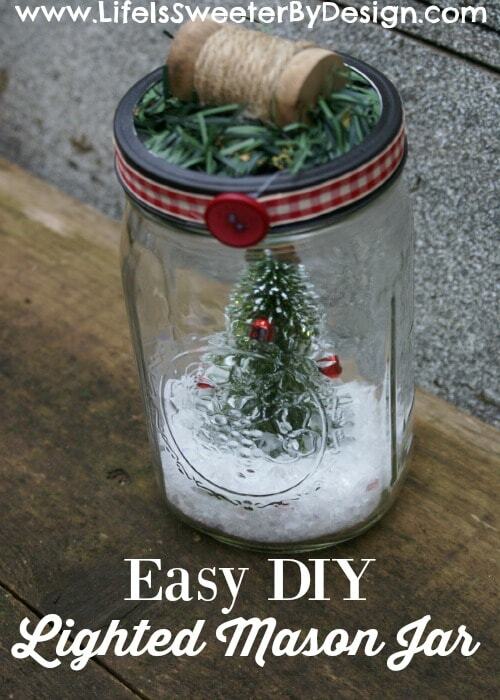 You want to decorate the top of the lid of the mason jar. This is really up to your imagination and creativity. 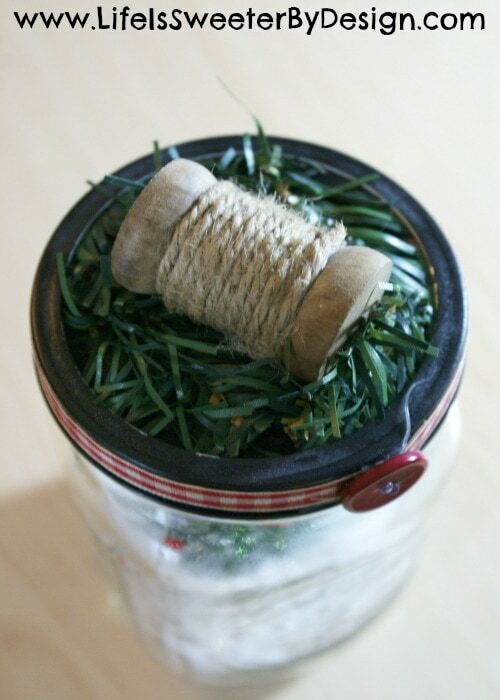 This jar has some greenery hot glued to the top with a wooden ribbon spool wrapped with twine. 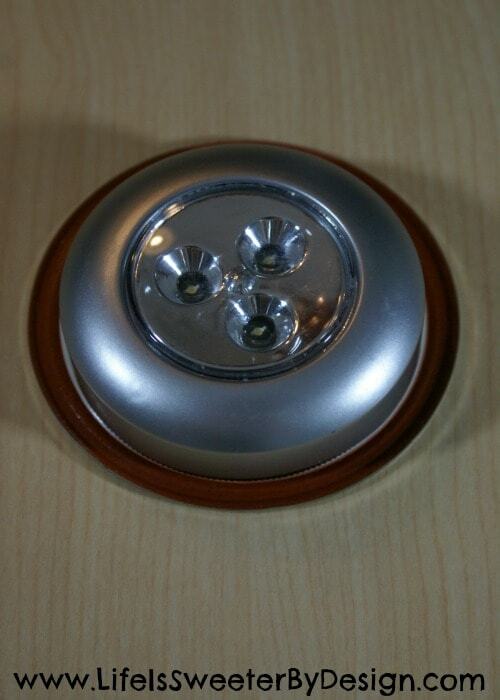 You could cover the top in red, green and white buttons or cover it with Christmas scrapbook paper! The ideas are endless…just look at your supplies and GO! You can also use some pretty ribbon to decorate the outside ridge of your lid. Just glue it on and add a button for some extra flair! The inside of the jar is also up to you! 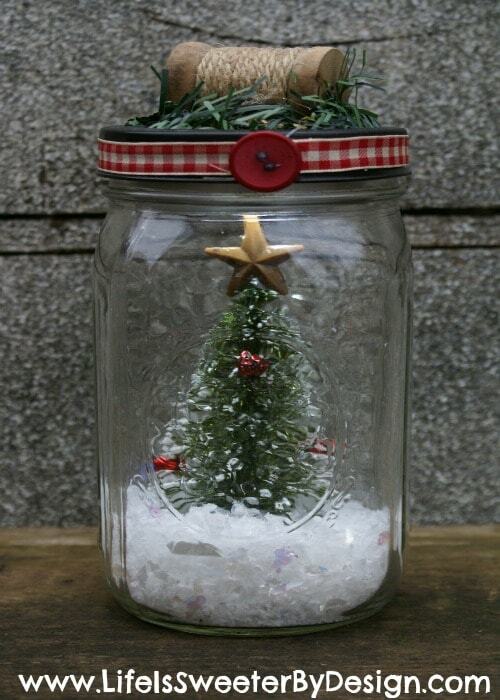 This jar has a cute little Christmas tree. The Lemax Christmas Village sets have a lot of really cute items that could go into your jar…trees, lamps posts, bird feeders, etc. You can find these sets at Michaels on sale a lot around Thanksgiving and Christmas! Take your main item…for instance your Christmas tree and add a dollop of hot glue to the bottom and just put into your jar and hold to the bottom center for a minute until it is nice and stuck! I love a simple scene so I just added some of the fake loose snow to the bottom of the jar. If you want more items in your jar, feel free to go crazy! Just be sure to glue the items down! The end result is the sweetest Lighted Mason Jar that looks great glowing in the evening on my shelf!! 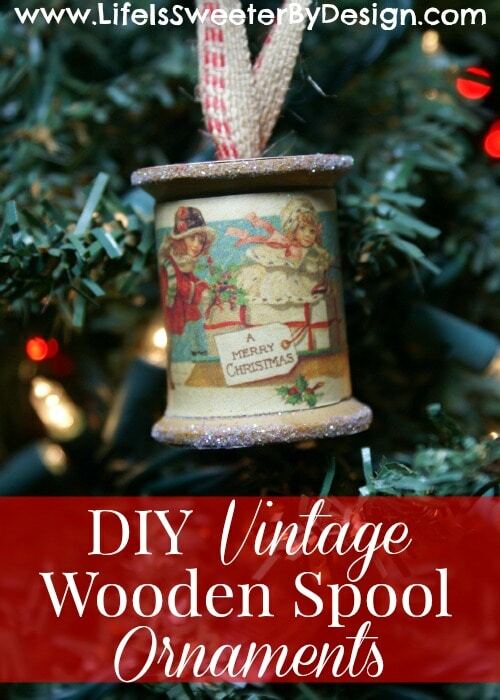 Be sure to check out some of my other holiday craft tutorials for some fun and easy ideas! Thanks Alisha….yes I think a snowglobe would be awesome, too! !